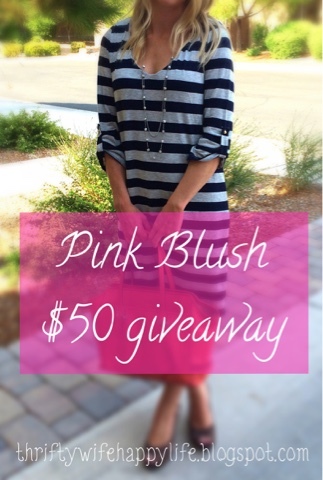 Thrifty Wife, Happy Life: Mom Wear + Pink Blush + $50 Giveaway!! Mom Wear + Pink Blush + $50 Giveaway!! Lately, my wardrobe has quickly been turning into mom wear. To me, mom wear is anything that I can throw on quickly, that's comfortable and practical, but also stylish. Little Jack does not like to let me have too much time to get myself ready in the morning, so that's why it's nice to have those pieces of clothing that are mindless and require very little effort to put together and still look stylish. This is why when Pink Blush asked me to collaborate with them, I jumped at the opportunity! When I was pregnant I remember coming across a lot of Pink Blush maternity clothes on Pinterest and I loved what I saw! What I didn't realize at the time was that Pink Blush is so much more than just maternity clothes. They also have a women's line, perfect for busy moms. While I was pregnant, I enjoyed styling my bump in non maternity clothes, because it was more practical for me to get the most out of my wardrobe. That's why I bought clothes that I could wear during and after my pregnancy. This is why I love Pink Blush so much. Their women's line transforms perfectly from pregnancy into mom life. I am currently loving my new dress from Pink Blush! This dress is pretty much my definition of what mom wear is. It's comfortable, practical and stylish. 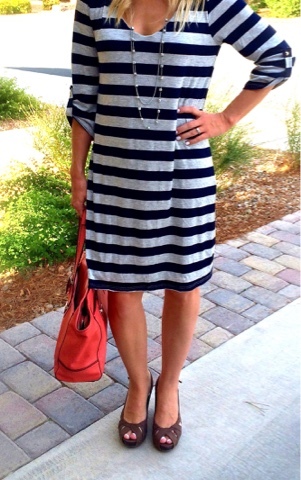 It is quickly becoming my go to dress; perfect for work, running errands, church or for family outings. Of course I like to stick with what I'm comfortable in and stripes are always my go to pattern. The great thing about this dress is that it would also work perfectly if I were pregnant again. Another thing that I love about this dress is how versatile it is. I love that I can wear it casually with flip flops or flats or I can dress it up with some wedges or heals. It's perfect year round for any season. I can't wait to style it with some leggings and boots this winter. Of course I'm always looking for a deal and I find Pink Blush to be very affordable. I can even stick to my $30 shopping budget. The site always has some sort of discount promo code running along with 15% off your first order, plus free shipping, which always makes me happy! Leave me a comment on Instagram with the #pinkblushgiveaway in it. I will announce the winner on Instagram on August 20th! *Please note- If you have won a Pink Blush gift card within the last 3 months you will not qualify for this giveaway. *Disclaimer- This dress was given to me by Pink Blush in exchange for this review. My review is 100% my honest opinion.